As we grow older, the thick vitreous gel in the middle of our eyes begins to shrink and pull away from the macula. As the vitreous pulls away, scar tissue may develop on the macula. Sometimes the scar tissue can warp and contract, causing the retina to wrinkle or become swollen or distorted. The macula normally lies flat against the back of the eye. When wrinkles, creases or swelling affect the macula, vision can become blurry and distorted and you may even have a blind spot in your central vision. Most macular puckers are related to vitreous detachment, which usually occurs in people over age 50. As you age, you are at increased risk for macular pucker. A macular pucker can also be triggered by certain eye diseases and disorders, such as a detached retina and inflammation of the eye (uveitis). Also, people with diabetes sometimes develop an eye disease called diabetic retinopathy, which can cause a macular pucker. 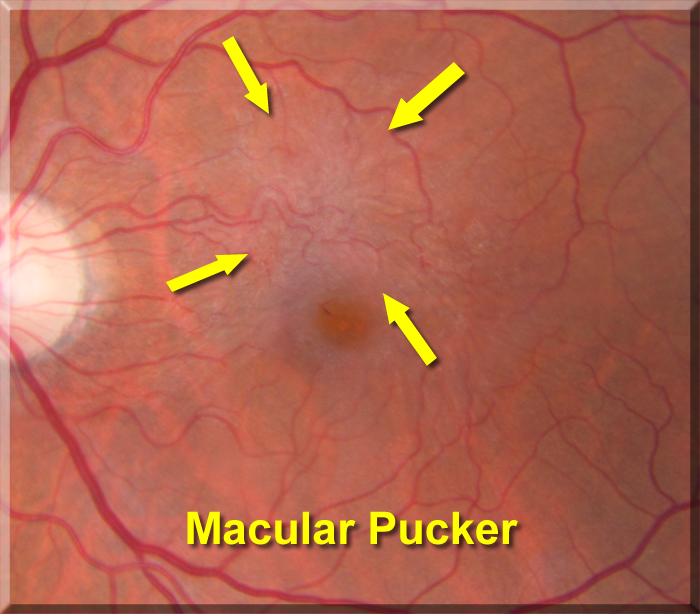 A macular pucker can also be caused by trauma from either surgery or an eye injury. Most of the eye's interior is filled with vitreous, a gel-like substance that fills about 80 percent of the eye and helps it maintain a round shape. The vitreous contains millions of fine fibers that are attached to the surface of the retina. As we age, the vitreous slowly shrinks and pulls away from the retinal surface. This is called a vitreous detachment, and is normal. In most cases, there are no adverse effects, except for a small increase in floaters, which are little "cobwebs" or specks that seem to float about in your field of vision. However, sometimes when the vitreous pulls away from the retina, there is microscopic damage to the retina's surface (Note: This is not a macular hole). When this happens, the retina begins a healing process to the damaged area and forms scar tissue, or an epiretinal membrane, on the surface of the retina. This scar tissue is firmly attached to the retina surface. When the scar tissue contracts, it causes the retina to wrinkle, or pucker, usually without any effect on central vision. However, if the scar tissue has formed over the macula, our sharp, central vision becomes blurred and distorted. Vision loss from a macular pucker can vary from no loss to severe loss, although severe vision loss is uncommon. People with a macular pucker may notice that their vision is blurry or mildly distorted, and straight lines can appear wavy. They may have difficulty in seeing fine detail and reading small print. There may be a gray area in the center of your vision, or perhaps even a blind spot. 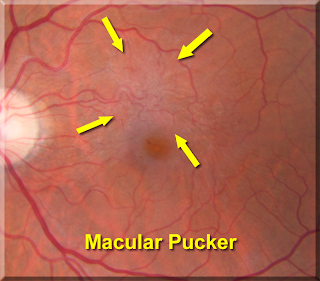 Symptoms of macular pucker range from mild to severe. Usually macular pucker affects one eye, although it may affect the other eye later. Vision loss can vary from none to severe vision loss, although severe vision loss is uncommon. A macular pucker does not affect your side (peripheral) vision. For most people with macular pucker, their vision remains stable and does not worsen over time. During an eye exam, your ophthalmologist will dilate your pupils and examine your retina. You may have a test called fluorescein angiography that uses dye to illuminate areas of the retina. A macular pucker usually requires no treatment. In many cases, the symptoms of vision distortion and blurriness are mild, and no treatment is necessary. People usually adjust to the mild visual distortion, since it does not affect activities of daily life, such as reading and driving. Neither eye drops, medications, nor nutritional supplements will improve vision distorted from macular pucker. Sometimes the scar tissue--which causes a macular pucker--separates from the retina, and the macular pucker clears up. For more severe symptoms, a surgery called vitrectomy is recommended. The surgery is usually performed as an outpatient procedure in an operating room. During surgery, your ophthalmologist uses microsurgery instruments to remove the wrinkled tissue on your macula and to remove the vitreous gel that may be pulling on the macula. Sometimes an air or gas bubble is placed in the eye to help the retina heal or to seal any tears or holes. After the tissue is gone, the macula flattens and vision slowly improves, though it usually does not return all the way to normal. After the operation, you will need to wear an eye patch for a few days or weeks to protect the eye, and you may need to do some particular head positioning if an air or gas bubble was placed in your eye during surgery. You will also need to use medicated eye drops to help the eye heal. In most cases, while vision improves after macular pucker surgery, it generally does not return to normal. It can take up to three months for vision to fully recover. On average, about half of the vision lost from a macular pucker is restored; some people have significantly more vision restored, some less. In most cases, the visual distortion of macular pucker is significantly reduced. Surgery to repair a macular pucker is very delicate, and while vision improves in most cases, it does not usually return to normal. On average, about half of the vision lost from a macular pucker is restored; some people have significantly more vision restored, some less. In most cases, vision distortion is significantly reduced. Recovery of vision can take up to three months. Patients should talk with their eye care professional about whether treatment is appropriate. The most common complication of a vitrectomy is an increase in the rate of cataract development. Cataract surgery may be needed within a few years after the vitrectomy. Other, less common complications are retinal detachment either during or after surgery, and infection after surgery. Also, the macular pucker may grow back, but this is rare. For most people, visual acuity remains stable and does not get progressively worse. Usually macular pucker affects one eye, although it may affect the other eye later. A macular pucker and a macular hole are different conditions, although they both result from the same reason: The pulling on the retina from a shrinking vitreous. When the “pulling” causes microscopic damage, the retina can heal itself; scar tissue, or a macular pucker, can be the result. If the shrinking vitreous pulls too hard, it can tear the retina, creating a macular hole, which is more serious. Both conditions have similar symptoms – distorted and blurred vision. Also, a macular pucker will not “develop” into a macular hole. An eye care professional will know the difference.